The cold has brought all epoxy work on the boat to a halt, but there's still a ton of work to do. Friday, I drove down to see my friend Peter at Buzzards Bay Yacht Services to see what he has been up to and to drop off my old rudder shaft with his machinist to fabricate a new one. He has a bunch of projects in the works and will be really busy over the winter. When I showed up, he and his crew were working on pulling the old teak decks off a Baltic 42 in preparation for new ones. The removal of my teak cockpit sole was still painfully fresh in my mind (which was only about 10 square feet) and I can't imagine doing this job where almost every horizontal surface is covered in teak that needs to be ripped off. Uggh. 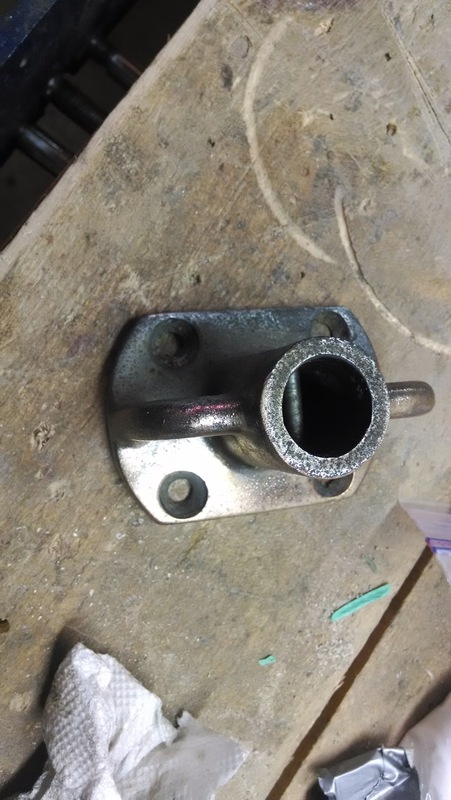 Anyway, I left fabrication instructions for the new rudder shaft off at the machinist and hope to hear back this upcoming week so I feel like I'm moving forward a bit on that front. The rest of the weekend went by in a whirlwind of family activities as usual, but I did carve out a few hours on Sunday to start dry mounting the lifeline stanchions. 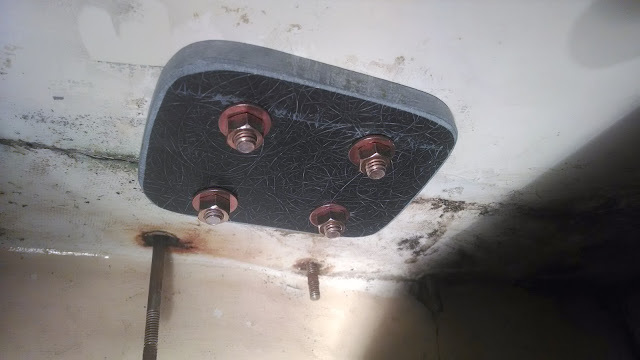 By dry mounting, I mean that I tapped and fitted them but didn't fasten them permanently with butyl tape (the sealant I'll be using for most deck fittings) because I want to get some paint on the underside of the decks before I permanently mount them. I had recently ordered $100 worth of 2-1/2" Silicon Bronze screws, washers, and nuts and wanted to see them installed. All in all is was pretty straight forward but you have to make sure your tap is going straight down or it will be difficult to mount the backing plate. The first one I lined up the stanchion on the backing plate and pre-tapped the backing plate holes. Unfortunately, when I tapped the holes in the deck, I must have been slightly skewed and the screws didn't match up with the backing plate. Place the stanchion on deck at desired locations. 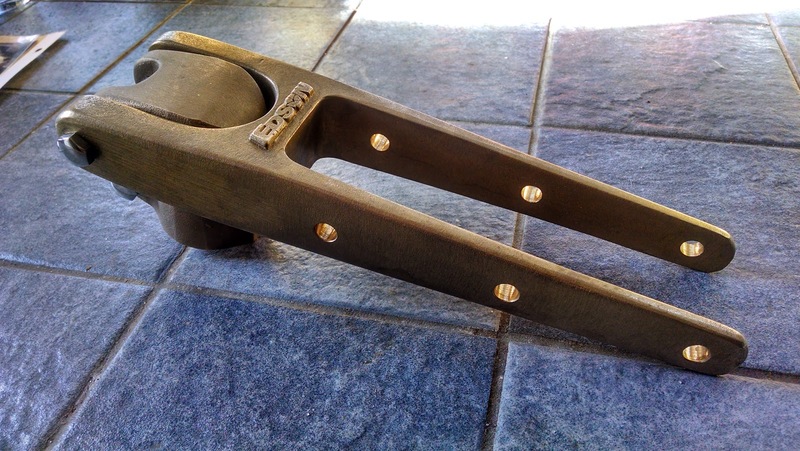 Tap all 4 holes in deck using stanchion as guide (5/16" bit). Chamfer the edge of each hole by overdrilling with a countersink bit to allow for a slight bevel (see bevel photo). This serves to reduce stress related fractures in deck when stanchion is put under load and allows a ring for butyl tape to bed nicely into. 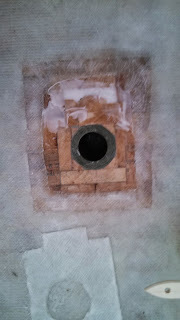 Tap one hole in backing plate and mount tight on underside of deck, making sure that it is positioned properly. Tap remaining 3 holes in backing plate from the deck, using the mounted stanchion as a guide. Fit bolts in stanchion and add washer and nut. I still have to paint and remove the old fasteners before I permanently mount the stanchions. With the cold firmly in place and the rudder project stalled until I have a new rudder post fabricated, my hopes for finishing up the cockpit this season are diminishing by the day. I still have lots to do though and I've turned my attention toward getting some of the deck hardware cleaned up and ready for re-install. 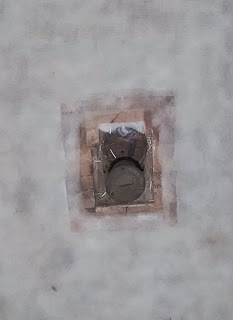 I'm hoping that I can get some of it re-installed even though it is cold since I'm going to be using butyl tape for a lot of the hardware and it can be warmed up with a hairdryer sufficiently to snug the pieces in place. The stanchions and lifelines have been sitting in a bin for several years waiting for some love and I finally got to them over the past week. The lifelines are complete junk and I'll need to replace them so I cut them off with an angle grinder to liberate the stanchions. Next I needed to remove the stainless steel stanchions from the chromed bronze bases. 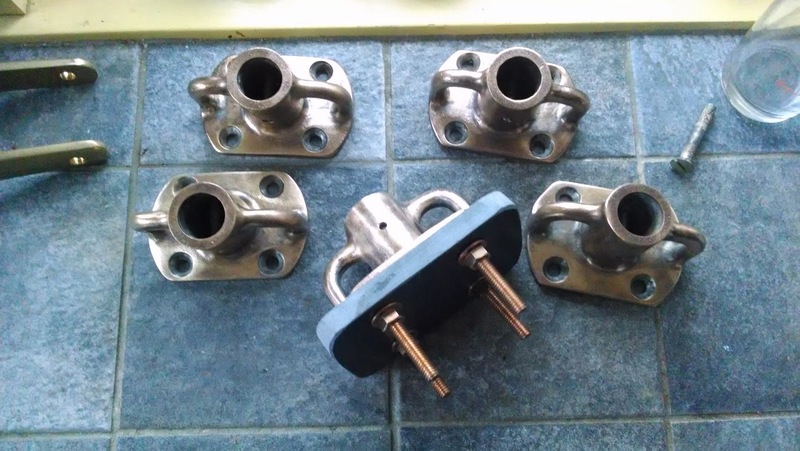 There is a set screw on each stanchion base that locks the stanchion in place and the first 2 came off without a fight, but the remaining 5 proved to be less willing to part so sprayed them down with PBBlaster and left them overnight which allowed me to free up 3 more. The final 2 decided that they needed heat to break the set screw out so I hit them with a torch and finally more PBBlaster before setting them aside. The next day I was able to free the last 2 set screws but the last stanchion decided it didn't want to leave the stanchion base, but I was able to move forward with cleanup on the other 6. 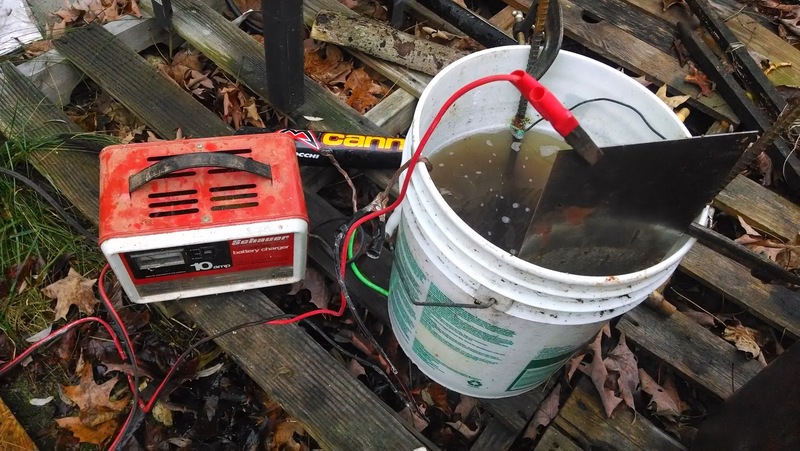 I set up my trusty electrolyzer bucket and battery charger with a steel plate for the anode and dunked each stanchion base one at a time for the cathode. After several hours with the battery charger running the stanchion base came out black, but smooth and free of years of corrosion, dirt, and general nastiness. I dried them off and hit them with a wire wheel on my drill press for a few minutes to reveal the underlying shiny bronze. I repeated this for each of the 6 free stanchion bases and got them all pretty again. 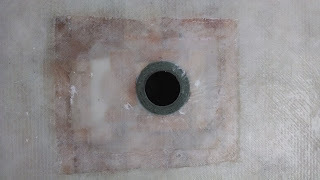 Next, I used a 1' x 1' piece of 1/2 inch fiberglass plate (the same type that I am using for the rudder tube junction on the deck here) and cut it up into 9 equally sized pieces to use as backing plates. Then I hit each one with a belt sander to round the corners and smooth out the rough edges. 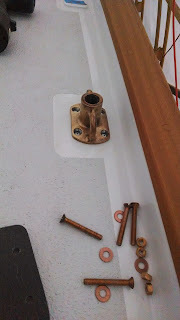 Finally I tapped the 5/16" holes for the 2-1/2" silicon bronze bolts I bought to secure the stanchions to the deck. I still have to deal with the final base that won't give up the stanchion, but I may start mounting the finished ones in the meantime. After what seemed like a reasonably warm autumn, it looks like the cold is here and probably to stay. As a result I didn't get too much done this weekend, but it did warm up enough on Saturday to allow me to epoxy in the core around the fuel tank fill tube. Knowing that it would be difficult to work around the existing rubber fill hose that goes to the fuel tank, I spent about 30 minutes lying on my back in the quarter berth yelling at the stupid thing because it just didn't want to come out. It's only about an 8" length of hose, but the access is poor and it was just 'fused' on. I eventually gave up trying to get it off in one piece and took a hacksaw blade (a full hacksaw wouldn't fit) and cut it diagonally where it was stuck onto the tank. 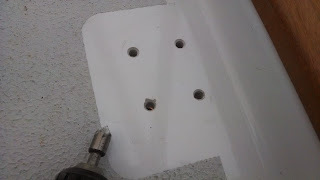 Once the tube was off, I cut off a 3/8" piece of fiberglass tubing that I had ordered for the new rudder tube to use as the flange for the fill tube entry. 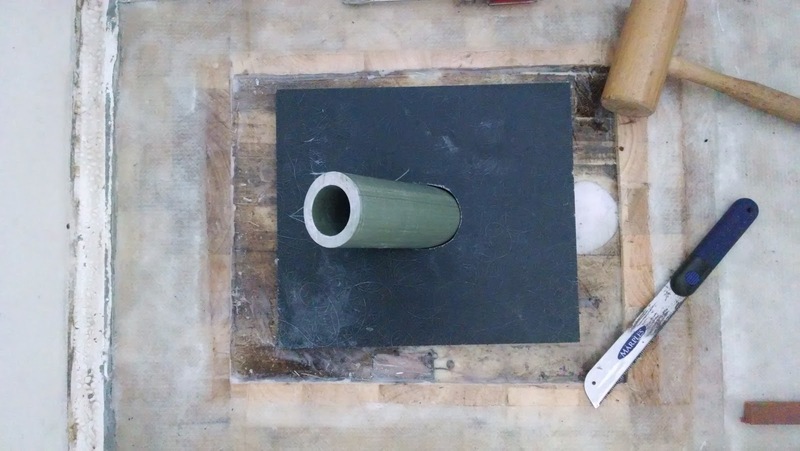 I have lots of extra tube from the rudder project (I had to order a 5 foot length but only need about 20 inches) and as luck would have it, the fill tube is not quite 2 inches in diameter so the rudder tube (2 inch inner diameter) was a perfect fit. It will serve as a mounting point for the fill cap and will isolate the core from any water intrusion. Once I fitted the tube, I cut out enough balsa to fit around the gap I had left in the deck surrounding the fill tube and glued it all up. Since it was such a small area, I ended up doing both the core and the first layer of biaxial in one shot. 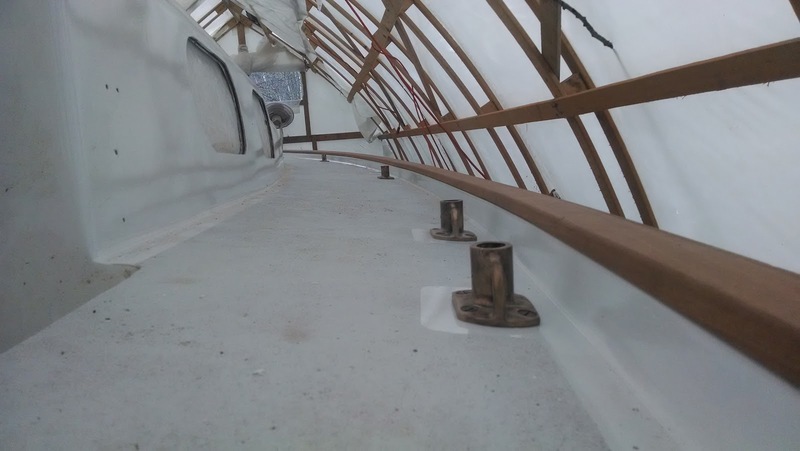 The tiller conversion and new rudder projects are moving along like the temperature; glacially slow (although the glaciers seem to be melting pretty fast these days). Before I can really move forward to any degree, I need to get the new shaft fabricated. Once that is done I can fit the rudder tube to its final position. The only thing I did was to cut the fiberglass rudder tube down to the final length so that the final position will have the tube extending about 6 inches above the finished deck.